Harbinger nodded and, with another flourish, sheathed the blade and deposited it inside of his cloak. Walking over to the man, he bent down and picked up the blade, turned it over, and offered the hilt back to him. Customs, of course, and the role of vassal offered. A role of servitude with a nice sounding name. And Harbinger of the many titles loved his fancy names. "Take back thy blade then, vassal, and come along. I've an army to raise and a betrayal to repay tenfold." He took the blade and lifted himself back to his feet, sheathing it slowly in it's place behind him, giving another respectful bow of his head he spoke once more. "Then allow me to collect my discarded weapons, we shall then make sure it follows the proper course." He was glad that he had chosen this one to combat, his wants were things he understood well, that he could greatly assist on accomplishing. He moved off, recovering his weapons and returning them to their proper places before correcting his cloak, only the head of the halberd visable next to his shoulder. He caught up to his new master and awaited his movements, ready to follow him wherever he may lead. ۞Who's with me?Rius, Blackie and my own thoughts. ۞How do I feel?Amused, Occupied, Thoughtful. ۞What's on my mind?A small...gift for the victor...then off to work. 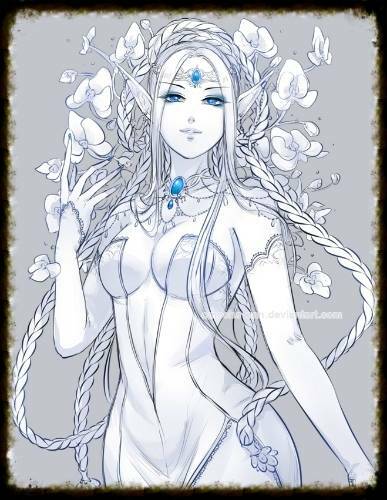 Exiting the tavern and inn once more, Aeos floated over towards the ancient relic once more, the object that created the portals to this world, a small creature lightly held in her arms as her piercing gaze set upon the relic for a few thoughtful moments. She then smiled to herself and raising her left hand, tossed a flat, card like object towards the gentleman that had approached her earlier that afternoon. The sun was at last low enough in the sky in it's setting that it wouldn't cause her such discomfort as her parasol remained open and held easily in her right hand. The object she threw over her shoulder towards the stranger was deep crimson, almost as though it were blood, yet it shined in the light and was aimed towards the side of his head. "You dance well...perhaps next time when I am not so inundated with my tasks I can indulge in conversation with you. For now, this will help you at a later date..." she said in casual tones and made her way out of the area, heading towards another part of the city upon her own errands. Harbinger scowled as she spoke, the malice contained form permeating the air, but obvious on his face (though she would be unable to see it). He snatched the ruby card like object from the air, turning it over in his glove before placing it inside his grimoire on the 'bind spell' page, just in case it went off to harm him. Managing to keep his voice calm and collected, he responded with pleasantries of his own. "Perhaps, unless a blade should sooner piece your heart." He began to walk away from her, mulling over his options in his head. How to raise an army to conquer a city, after all a king requires a kingdom, and an emperor a starting point, as was his nature as the Fourth. AFter a while wandering the street, staring at the relic, he spoke almost quietly to the vassal. "The rich want to stay rich, and the poor to overthrow the rich so they may become wealthy. such is the nature of things, though they may not fall true here, given all that has no doubt befallen this world. Tell me Vassal, have you seen enough here to decide what route to take in swaying the people to a cause?" "Of I may speak so plainly, my lord, I have already formed a plan along your same thinking some time ago, I merely lacked one to express it to. With a bit of encouragement you can convince the rich that the poor are trying to take what they have away, this will cause them to put more pressure on those below them and those above as they seek a way to keep the poor down...this will cause the pot of social pressure to come to a dangerous boil..."
He allowed it to trail off there, he was keenly aware of his lords intellect, it was true as well that this was not the first such plan he had enacted under similar circumstance. This place just seemed more ripe for it, there was a much more defined difference between the upper and lower class, that would no doubt play to the advantage of his lord. His ears were keeping up with everything around the pair, his first order of business was to be a bodyguard, even if the one he guarded was stronger then he. Harbinger nodded quietly, contemplating. Yes,of course he had intended to paint himself the hero, he had only lacked the knowledge of the people here to devise the plan. And with the given status from the Vassal, he now had a place to start. Create the civil dispute, create the civil war within the city, and guide the poor to power. of course the rich would be easier to lead, but such was not his way. He was not cruel, the people needed a fair ruler, a king they admired. After all, a beloved king retains the support of the people far better than a tyrant, and by disrupting the hoarding of the rich he could rebuild the wretched city, make it a jewel of the desert. Yes, this surely was the path to take. "A wise observation. However the first problem, then, is how to convince the nobility of the poor's intents, without starting the war in full. If we are to create a revolution to oppose them, the pot must be boiling, yet not so that the people are destroyed before they are ready. We must convince then, after the nobility have come to boil, that we are there to help them, and create a force strong enough to threaten the nobility. And thus shall we create the beginnings of an army, a kingdom, and make it so that their ruler retains the support of the people." He nodded again and stood a little taller, looking about at the myriad of people, humming to himself. So many, it would take much work to overthrow the rich should full scale war come to pass. They would have to avoid the destruction of the city itself, and minimize loss of life. Of course, from what he had seen, the city seemed to be one willing to change on a coin, given the number of obvious merchants and mercenaries about. "The merchants too must join. To create an economic powerhouse, and supply an army. The boorish parts of politics, but the necessary steps to creating a rule." "I would suggest then that we start with rumors, it is my experience that barkeepers speak these the most, the right words whispered in the right ears can sway many. First allow rumors to encore the peoples passions, then once those fires are stoked another rumor to the shop keepers, one that suggests hard times ahead. This will both cause the shops to consider their standing but will also no doubt reach the ears of those in power toward the defensive, likely creating the dissent we seek." He did not pay attention to those around them for anything aside from signs of attack, but he did consider the volume of his voice, keeping it lower so that only his lord would hear him. The scents of the small stands flared his nose, they did not eat much that met his particular appetite in this place, these smells offended his senses though it did not full them. The thought of getting to be part of a rebellion was an excîting one, another chance to do which he did best, to fight. "Indeed, there is much work to be done sewing the seeds of rebellion. The first step, however, would be to find a tavern that the rich would be seen in. Most of these cater to the poor, the merchants, or mercenaries. All of them wonderful for the intention of creating my army, but the civil dissent must be sewn elsewhere, somewhere more, fancy. And then the rich will do what the rich have always done, gossip the day away. After all, while swaying the shopkeeps will inevitably make the rich nervous, their paranoia must be ready to burst by the time the needle strikes. Of course this leaves two problems..."
He trailed off as he began to, in his head, try to figure the best possible answers to the two problems he was about to present. The answer to the first would be simple enough but, the second offered a huge disadvantage to hi if he couldn't unravel, and it was quite the twisted knot indeed. "... first of all we will need to find mercenaries to assist in training the underground militia that ill be created before the rebellion, as well as weapons and armor fitting enough that they wont be defeated merely for lack of tools. The second problem, however, is one of symbolism; Who is the leader of the city now, and where is the most iconic, symbolic location in the entire city save for this relic. After all, these guards seem to care little save for the relic's safety, and leaving them alone will put the militia in good graces. And of course, defeating the leader and planting symbolic victories over the most iconic and symbolic locals would destroy morale for the enemy." Khys'Ran was curious about the rest of this world, and wandered off to indulge itself in knowledge. "Perhaps the mercs can handle the problem two fold, if they have good equipment perhaps we can obtain the information from them as to where we could obtain a steady supply." He considered for a moment where the best location of finding mercs would be, based on previous knowledge. He wasn't sure though, likely there would be one they could ask but...they passed a board that struck a cord with him, he could not read but he understood it's purpose, a simple help wanted sign which also shown bounties for bandits and the like. "My lord...perhaps this can help us locate those that we need? It may be simple but in a location such as this it would not be particularly obvious either to those we would worry about seeing it." What's On My Mind? It begins. "Perfect. A good posting for a job, meetings with you to ensure they would do anything for their pay, and particular eye for those of a noble nature. Since we are fighting for the sake of the many, noble souls will be unable to resist fighting the good fight." He reached into his cloak ind withdrew a parchment, pinning it to the board and writing something on it with a flourish. Stepping back after doing so, he nodded and turned to the Vassal. "Of course you will be involved with the majority of the roumor starting, between the two of us you look far more, relate-able than I to the people who would be swayed by a barkeep. Meanwhile I will be interviewing mercenaries at that tavern, the Goblet. It is fairly popular, and when i seat myself in the corner no one bothers me without purpose. Save that drunkard from earlier." He nodded quietly, accepting the command and agreeing internally that it was the best course, most attributed drow with low class indiduals when they were on the surface if they were willing to speak to them at all, though it seemed this place had little in the way of hateed for his kind, likely being a rare sight if at all. "Your Will shall be done my lord. Shall I start on the task?" He said clearly, being sure his words were easy to understand, an old habit caused not only by his former master but also ingrained from years of beatings for having 'mumbled'. 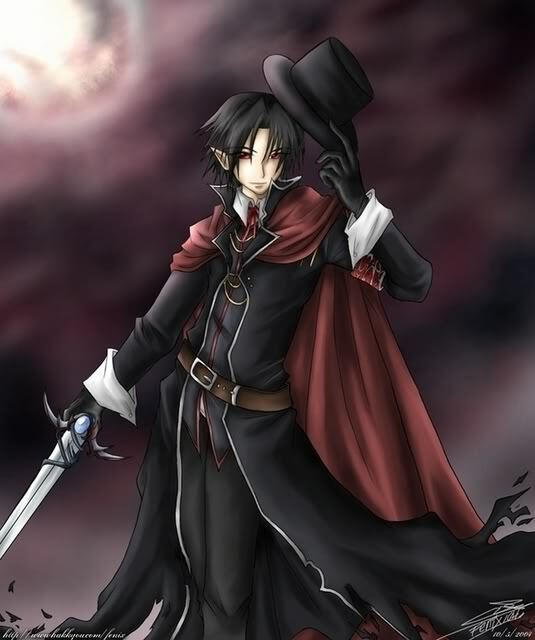 "Indeed, there is one mtater to atend to before the mercenaries show up bUT your task canot wait. I wI'll be there shortly." He spoke with a string tone, indicating he would indeed be there momentarily, and what he was to do was a person matter requiring that he be alone for a short while. Where he was, there would be no threat that could harm him, and his sense of duty and honor demanded what was to take place be done to tradition. The boy would, after all, be perhaps frustrated to annul the contract if his people's traditions were not kept. And harbinger liked this body a great deal. The gate flared into life as it turned a shade of red and swirled slightly, then turned a hue of purple. It died suddenly with a burst of energy and sitting in front, between the guards, a little jack in the box. It had blood on it and looked like it had been through fire and brimstone. It was battered and old, and almost pretty. No one knew where it came from or where it originated. Upon closer inspection it would reveal a bullet hole in the side, not through but almost as if it chipped the paint. It sat there between the two guards almost inviting someone to use it. Quiet and still it rested on the ground and waited. Waited as it has for a long time. having left the Goblet some time ago, Kasa had subconsciously walked continuously around the same district almost in one giant loop, her lack of direction obvious to a few when she walked past the entrance to the Goblet half a dozen times, yet somehow amazingly found her way to the building with out a problem, a mysterious happening that will for ever go unsolved... still aimlessly walking around Kasa soon found her self at the strange obelisk where she first found her self in this place, her attention drawn to a funny looking box sitting by the gate way between two guards. upon close inspection it looked like it had been to hell and back, its shape looking slightly like it was a children's toy though quite larger she would guess, Her fox tail flicked from one side to the other roughly every 10 seconds as she sat on the ground before the box with a strange look by the guards, "T-This thing gives me the chills... but what is it?" 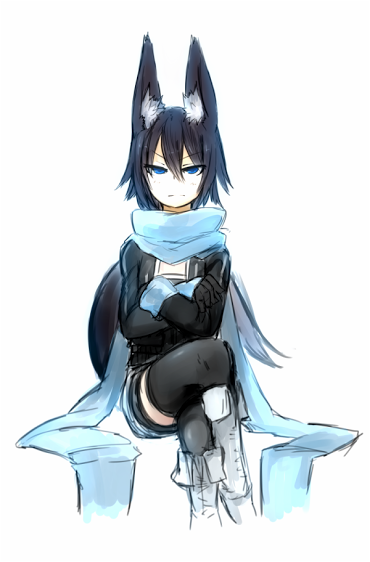 she would comment as her ears flopped down to the sides while just sitting there and staring at it as if patiently waiting for it to do something. The box sat there, as boxes tended to do.The handle looked inviting as it just rested in its spot, awaiting to be turned. It was slightly larger than a child's music box, estimating on 1 foot by 1 foot in size. It sat there on the ground, not moving, not making any actions as it rested calmly. 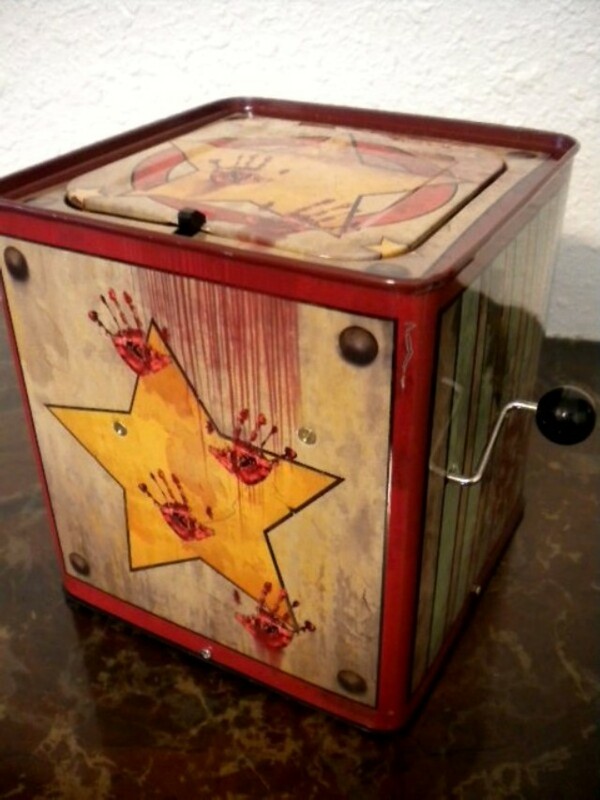 It had carvings etched into it, covered up by the paint of stars and pentagrams almost as if it was summoning beacon. The more anyone would look the more it looked like a holding container as it just rested on the ground. Within the box I stay. For the games I played. Kasa Clenched her left hand into a fist as she placed it upon the side of her head grabbing a handful of hair as she did, the tune now playing in her mind was quite annoying to her and slowly starting to piss her off, her tail stopped and sat motionless as she game the box a cold stare with an very unwelcoming look in her eyes "G-Get out of my head!" She growled with gritted teeth as she dragged her hand down from the side of her head to her lap and started to crunch her knuckles "cos this box will be a ball of scrap if not six feet under when im done with it otherwise" she Remarks growling still at the voice in her head before punching a 1 foot hole through the sandstone next to her with her right fist then shaking the sand off as she pulls her arm back. The sing seemed to repeat over and over as the box sat there motionless, silently inviting anyone to turn the handle. It silently tempted it own fate as it was a box and could not reply. The song repeated as it was joined by circus music, a demonic tune playing in the background as the box continued to sit there. "im about to punch a clean hole through something in a minute... and i dont care what It is! but for the love of god shut up and get the absolute hell out of my head!" she Growls once again, her tail bending with a crocked angle as the fur covering it bristles, "Fine i'll open the stupid box then break your face when i find you!" Kasa remarks while picking up the box, it was light for its size compared to most objects that actually feel like they have some mass to them but even in Kasa's current state she could still throw something as heavy as a car engine a good distance, the box would probably be well out of sight a few blocks down if the thought crossed her mind. she slowly gave the cubes handle a turn with her right hand it would became a solid fist the moment she let go of it. The box sung its song and once a complete play of it was through the noise in the girls head would stop. It sat there in her arms, silent as ever then the lid would crack open slightly, leaking a foul smoke that smelled of brimstone. It would leak out this smoke for around 5 minutes then open up, a single hand coming out holding a rainbow colored lollipop. The rest of her hidden in the other dimension within the cube. Kasa quickly pushed the box away from herself jumping to her feet as she took a couple steps back, it would seem that night fall had begun and light were turning on... all the more worse for what ever was in the box, their was nothing that sprung to mind for kasa to say and the smell was bad enough that one could only comment on how bad it was, she didn't have the slightest clue on what she just started as thinking ahead of time wasn't a strong suit of her's though what ever might happen she was hoping it could probably be something she could drive her fists into. Ty had for the most part finished his task fairly well and returned to this point where h had last seen his lord, thinking it beat to hold here since he was given no instruction on how to find him. Many interesting individuals had come through during his time there, if those were the caliber does they would be coming against then the rebellion could be in danger before it starts, though if they could be convinced it would be a massive boon for his lords ambition. He looked around and found it to be quiet here, leaning against a wall to relax, closing his eyes and keeping his ears open, the sound of combat a ways off was easy for his ears to pick up, disturbed by a loud bang that rolled through, the city was so active, it was strange. He would remain here till his lord returned, it was all he could do at this point. Harbinger was standing not too far away, his hands outstretched and his sword in the ground before him, tip in the ground. "Ar I rdeln hasa fallusa dha wusrn, rad nirr nasresedaiul ull wes iful Aurora fa cluwl eln dsia. I rherr lud sard ildair nirr fesd air sunfrada. (As I stand here before the world, let my declaration of war upon Aurora be known and true. I shall not rest until my pact is complete.)" He bowed his head before picking his sword up by the hilt, placing he weapon back into his cloak and turning about, noting the vassal standing there. With a nod he approached, his face back to a neutral state. His stance spoke fore him, asking how his duties were progressig. "The seeds of unrest have been laid my lord, time now will tell if they take and grow into something more...I took ear of other places such as that which I can further lay the social groundwork, but those can wait until you feel the time is right." He said evenly after looking over his master, giving a small but respectful bow to him after speaking, he had little else to say on that subject but he was still concerned with the power he had felt from some which were present, as well as the sounds his ears were picking up elsewhere. "There are many powerful fighters here my lord, a woman who was at the pub while I spoke to the people was most concerning to me, her power seemed to touch everything around her, I could feel it's waves though truth be told I have no way of knowing what she may be capable of...but I'm sure I could find her again if you wished it, my ability would be most adept at doing just that." With out much warning or sign a young woman seemingly stumbled backwards into this strange world and for the moment she appeared to be disoriented as she squinted her eyes, trying to adjust them to her bright surroundings. The first thing that come into sight was the strange monument before her, though unlike the one she had been looking at which was old and crumbling this one seemed rather new and seemed to glow with strange magic. Still confused and disoriented the girl stood up and carefully made her way towards the object and began reaching out to feel its surface ignoring or at the least unaware of the rest of her surroundings for the time being.